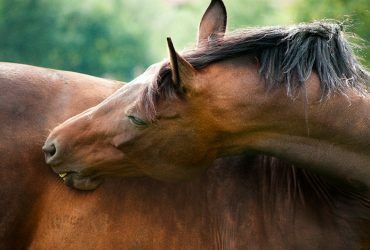 Expert information and guidance on the cause and symptoms of Sweet Itch, and how to effectively manage the troublesome condition with affected horses. Sweet Itch is extremely common and one of the most difficult skin conditions to control. The disease is caused by an allergic skin reaction to midge saliva introduced when the midges bite. Most cases are seen from March to October and remission usually occurs in the winter. All breeds can be affected, and there is evidence that susceptibility is inherited. 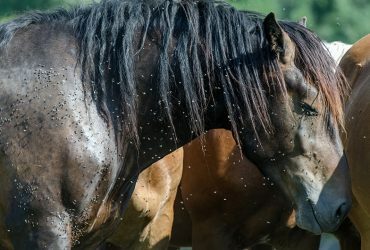 It is inadvisable to buy an affected horse unless you are prepared to make a major commitment in time, effort and expense to control the problem. Should the horse prove unsuitable for your requirements, it may be difficult to resell. The horse is at grass for all or part of the day. The problem can start at an early age, even as a foal. 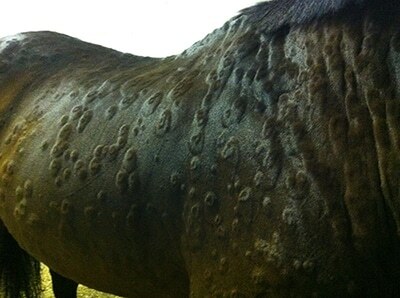 Older cases may occur when the horse is moved somewhere where midges are more common. Rubbing usually starts on the mane and tail and then spreads to the face, topline and rump. The area is rubbed bald, the skin may break and weep serum or even blood. Occasionally severe cases will also rub their legs, chest and belly. Rugs may be damaged due to rubbing on fence posts and so on. 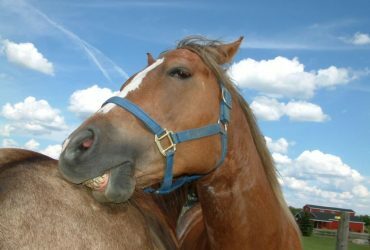 If the horse has nothing to rub on (for example if the paddock is surrounded by an electric fence), it may roll frequently, or when it is brought indoors, rub frantically on the stable walls. Long-standing cases develop corrugation and thickening of the skin of the dock and base of the mane. Undoubtedly the best control method is a purpose-made sweet itch rug that covers the head, neck, belly and dock. This must be used at all time, including when the horse is indoors. Sweet itch rugs should not be used if the horse is already rubbing, as it will ruin the rug in a matter of days. The rug was first used while the horse had active disease. Sweet itch may take a long time to subside and initial drug treatment is usually advisable. Not enough of the body is covered or the mesh size is too large, i.e. it is not a purpose-made sweet itch rug. A second-best approach is to apply an insecticide to the susceptible areas of the body. Benzyl benzoate is the ingredient of most proprietary sweet itch preparations. It is best mixed with an equal volume of liquid paraffin. Insecticides containing pyrethroid compounds are moderately useful but the concentration must be increased from that recommended for fly control and they must be applied every day. There are a huge number of proprietary anti-sweet itch skin lotions and creams. Most are combinations of repellents and insecticides and must be applied generously (on the face and dock, and extending about 30cm/12inch either side of the spine) and at least daily. They are rarely as effective as a sweet itch rug. Insecticides are much more effective if the mane is hogged and the dock is trimmed or pulled short, and they must never be applied to inflamed skin. In general pure fly repellents, especially if based on essential oils (citronella, tea tree and so on) are useless as they are far too short-lived. Repellents containing DEET are more effective but they need to be applied twice daily at least. Keeping the horse indoors during the peak periods of midge activity (dawn until 10am, and 3pm until after dusk) is useful. However, during still, humid weather midges may be active all day. Hang net curtains over doors and windows and use a strong fan to discourage midges entering stables. Sweet itch susceptible horses are best kept in exposed windy fields well away from damp sheltered area where midges breed. Garlic is popular but no true repellent activity has been demonstrated in research studies in people. Research in Canada indicates that feeding linseed (cooked linseed or feed-grade linseed oil) reduces the irritation resulting from midge bites. Homeopathic remedies have in general been ineffective. When short-term treatment is necessary to eliminate clinical signs while other methods are organised. Where the owner is not able or willing to use other approaches. Corticosteroids are extremely useful and will suppress clinical signs effectively. However long-term corticosteroid treatment carries a risk of inducing laminitis and should only be used as a last resort. Antihistamines are only moderately effective and must be given in large doses. This is an immunological approach to control. The aim is to induce blocking antibodies that prevent the sweet itch inflammatory response. Unfortunately, the treatment is expensive, requires multiple injections, has mixed results and takes a long time to work. It is not recommended at present. New immunological approaches are being developed.